NEW YORK (CNNMoney) -- The holidays aren't even over yet and shoppers are racking up returns already. Whether it's the wrong size, wrong style or just plain weird, shoppers will return $46.28 billion in holiday merchandise, a record high, according to the National Retail Federation. This year, shoppers are bringing items back even before those presents are wrapped or bows are tied. That's partly a result of record-breaking sales on Black Friday and Cyber Monday, when buyers flocked to stores like Target (TGT, Fortune 500), Wal-Mart (WMT, Fortune 500) and Best Buy (BBY, Fortune 500). "Higher sales will bring higher return amounts," said Kathy Grannis, a spokeswoman for the NRF. Some gift buyers are bringing purchases back now to take advantage of additional markdowns retailers are making in the days before Christmas, explained Candace Corlett of WSL Strategic Retail, a New York-based consulting firm. "Now they can get what they bought three weeks ago for 30% to 40% less," she said. A surge in online shopping -- and free or return shipping -- also is spurring the trend, Corlett said. Buyers often order more than one size or style before making a final decision on the item they want, then return the rest. At brick-and-mortar stores, early holiday returns can boost business because it gets shoppers into the store once more. "If people return something, there's a 70% chance they will buy something else," said Britt Beemer, retail analyst and chairman of America's Research Group. For gift givers and recipients, holiday returns have become, well, a given. 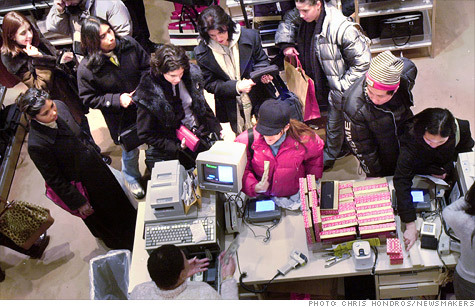 Altogether, holiday returns account for about 10% of all holiday sales, the NRF said. "Returns are a big part of the whole Christmas gift-giving thing," Beemer noted. In a survey by American Express, a majority, or 56%, of gift givers said they don't care if their gift gets returned -- in fact, 62% of holiday shoppers said they include the gift receipt for just that reason, according to a separate survey by the NRF. Just 14% said they would be embarrassed if the gift they gave was returned, while 12% would be downright offended, the AmEx survey found. Perhaps that's why most recipients -- nearly 60% -- said they would not fess up if they did return a present, according to AmEx. That's their story and they are sticking to it: An unlikely 65% of holiday shoppers said they didn't return a single gift last holiday season, according to the NRF.